This Demonstration lets you play three-dimensional chess. Set the number of kings that need to be captured to win. 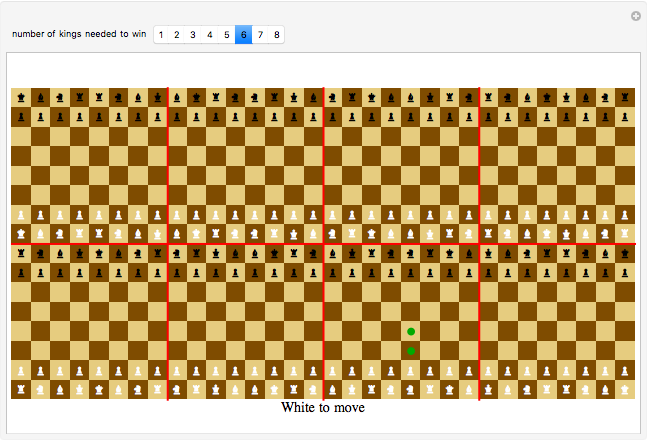 To move, click a piece and then click one of the green dots that show the potential moves for that piece. The boards are stacked in the order you would read them on the page, with the upper-left board in the top position and the lower-right board in the bottom position. You can visualize the three-dimensional aspect of this game by stacking the 8×8 boards on top of each other, left to right and top to bottom. Pawns can move one square forward, sideways, or "between boards." Pawns can capture forward diagonally, or by moving "between boards" then capturing forward or sideways. When a pawn reaches the opposite side of any board, it promotes. A knight at position moves to , where or some permutation of that. A king can move one square in any of the three directions. A bishop at position moves to , where or some permutation of that. A rook at position moves to , where or some permutation of that. A queen moves in any straight line.